There are just a few conservational topics one should prep for if moving to Columbus or to better assimilate into our society: 1) How ’bout them Bucks! – you can respond with any affirmative phrase or O H….pause. 2) How about that humidity! – again any affirmative or profanity will suffice. 3) What is your favorite pizza place? To this inquiry I would say, point behind the person then run. You are likely to encounter a highly partisan response. The good people of Columbus are passionate about pizza in general. In the 1990’s Columbus was decreed to be the pizza capital of the USA based on both the number of places serving pizza per capita as well as our frequency of consumption. The first pizza in Columbus is easily tracked back to TAT Ristorante in the 1930’s but the rise of pizzerias as we know them started in 1949 and never looked back. 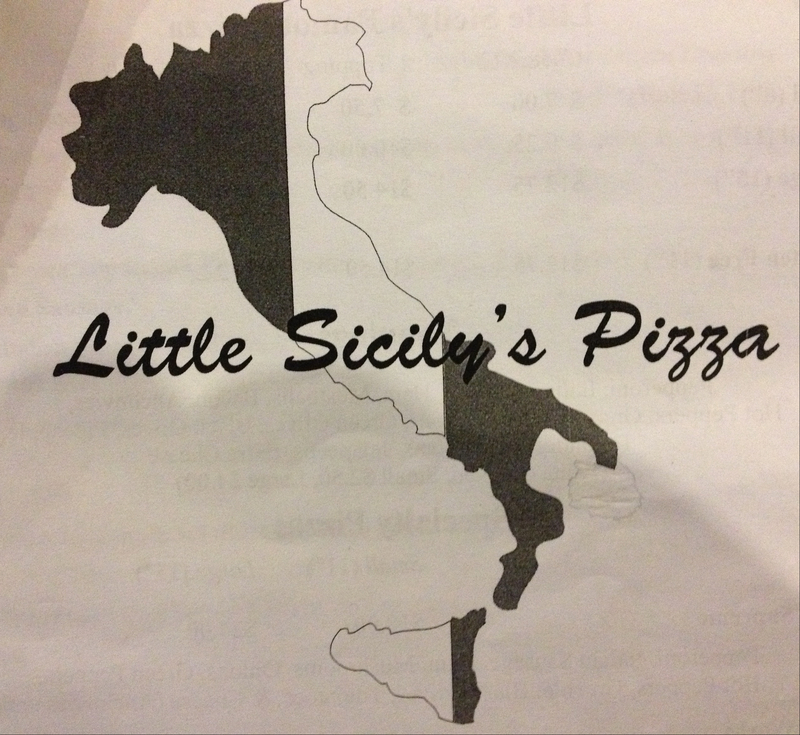 A favorite pizza place will tell you where someone grew up, often if they are a native and almost always what part of town they live in now. Pizza is not a light-hearted topic for casual conversation. This Week News had a few people come together to discuss the best pizza in Columbus and it was no easy matter. You can listen to episode 1 -> here. 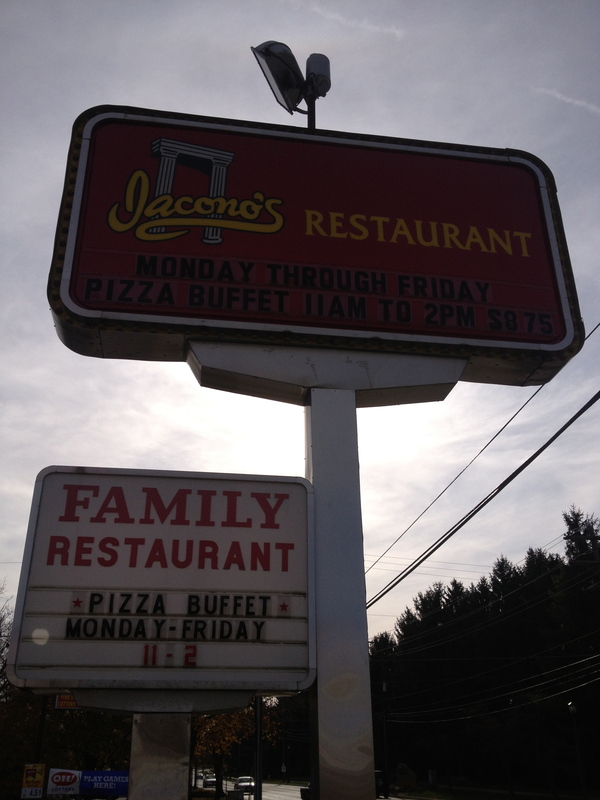 In my high school days, we were frequent flyers of the Iaconos pizza buffet. If memory serves me, I think it was all we could eat for $6. While, I never forgot about Iaconos, I did forget about the buffet in college and afterwards. As the years went by the general concept of pizza buffet downgraded significantly – equating with low quality pies and mass-produced mediocrity. Strangely although I love a true value meal I had forgotten about the Iacanos pizza buffet. During my temporary exile from Clintonville, I have required a centrally located base of operations for business meetings, so on a whim, I popped into Iaconos to meet with a client. I had forgotten how much I like Iacono’s and it was a bit of a homecoming as well bringing back memories of good friends and good times. The pizza buffet is a great value. 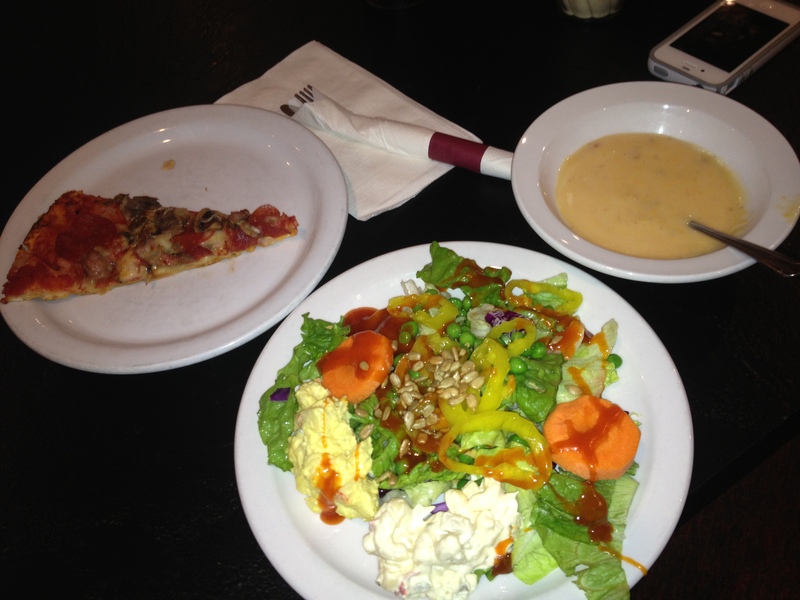 For $8.75 you get unlimited trips to the salad bar, plenty of pizza, soup and a bottomless fountain drink. I think we all have low expectations for salad bars today. The Iacono’s salad bar does not have any surprises, it is stocked with the basics of what we expect in a Midwestern buffet bar: peas, carrots, cottage cheese, macaroni salad, potato salad, pudding, sunflower seeds, a multitude of dressings including a tasty homemade Italian house dressing, and more things that I have forgotten. And while what I have listed are standards, we often don’t expect them to be good. The peas are fresh and still have a pop to them. The carrots are freshly cut. The potato salad tastes good. The soup choices change daily. There are typically two pizzas available throughout the afternoon. On my visits I have always observed staff asking arriving guests what their pizza preferences are and adding those requests to the pizzas coming out next. Shawn, the afternoon manager, greets guests and makes an effort to get to know repeat customers by name. And the pizza is as good as I remember it. Iacono’s pizza making history dates back to 1953. The Iacano family was among the founding pioneers of Columbus pizza. 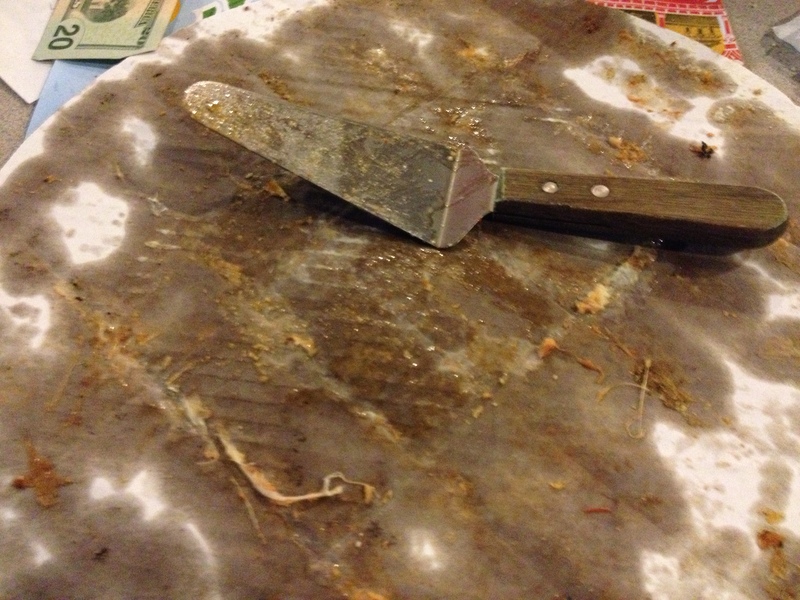 The crust has a nice “crackery” crunch and the sauce to cheese ratio is finely balanced. I always have a little lower expectation for buffet pizzas but what I have sampled to date has been on par with any dine in or carry out pizza. 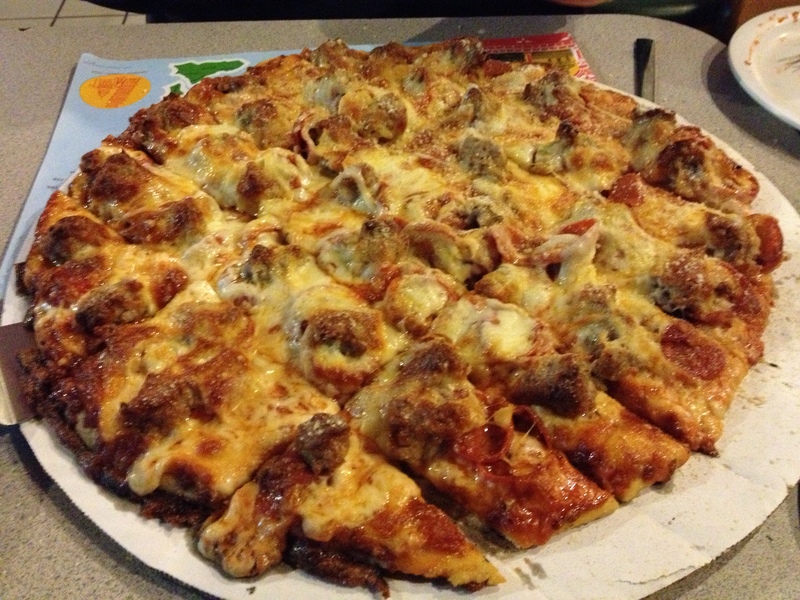 Other things I have discovered about Iaconos since I found my way back to being a regular customer almost everything is made in-house from scratch – the dough, the sauce, meatballs, sausage, lasagna, most of the dressings and so on. The cheese is hand grated. It is the little things that add up to a big difference. If you have low expectations of a pizza buffet – prepare to raise them with a trip to Iacanos. The buffet is offered weekly Monday to Friday 11 am to 2 pm.